Like most young children, B has had various short term "obsessions." His "obsessions" have included trains, cars (particularly characters from the movie Cars), the Bug show he saw at Animal Kingdom, Play-doh, stickers and Veggie Tales. Of them all, I am not sure any have compared to his current LOVE of letters. Sam and I have experienced a lot of joy, shared a lot of LAUGHs, and been amazed by his current love. Therefore, I had to document it, because as much as I would like to think I won't forget, I will. It all began after I checked out the LeapFrog: Letter Factory movie from the library. Every day since the first day he watched it, much of our play has been letter based (suggested by him). If you were to visit our home, you would more than likely find Bennett completing one or more of the activities mentioned below. He sings the alphabet song from Letter Factory which includes the sound each letter makes. He really enjoys doing this while jumping on his mini trampoline. 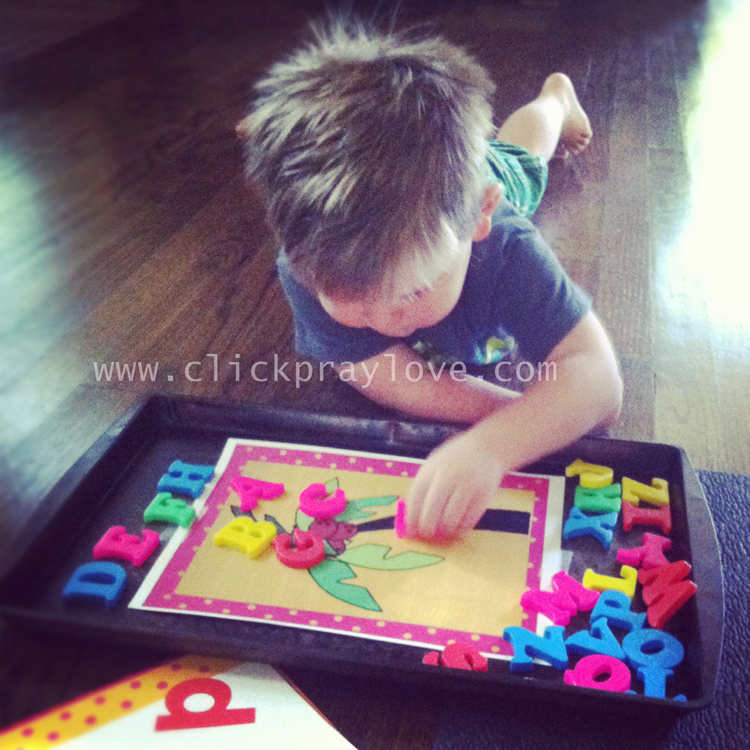 He enjoys working his wooden alphabet puzzle. He plays with his plastic magnetic letters daily. He wants to read ABC books--specifically Chicka Chicka Boom Boom and Dr. Seuss's ABC . We also have Sesame Street ABC's, Sandra Boynton's A to Z , and Mr Frumble's ABC (Busy World of Richard Scarry) --all of which he enjoys. 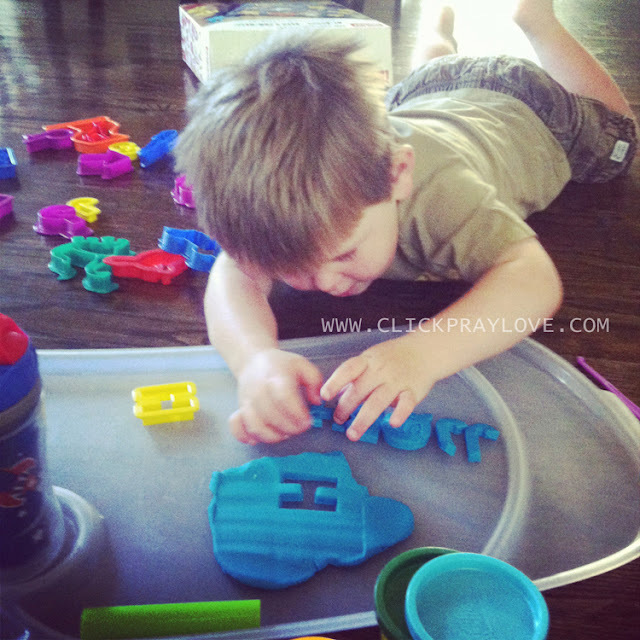 He LOVES to use our alphabet cookie cutters and make Play-doh letters. 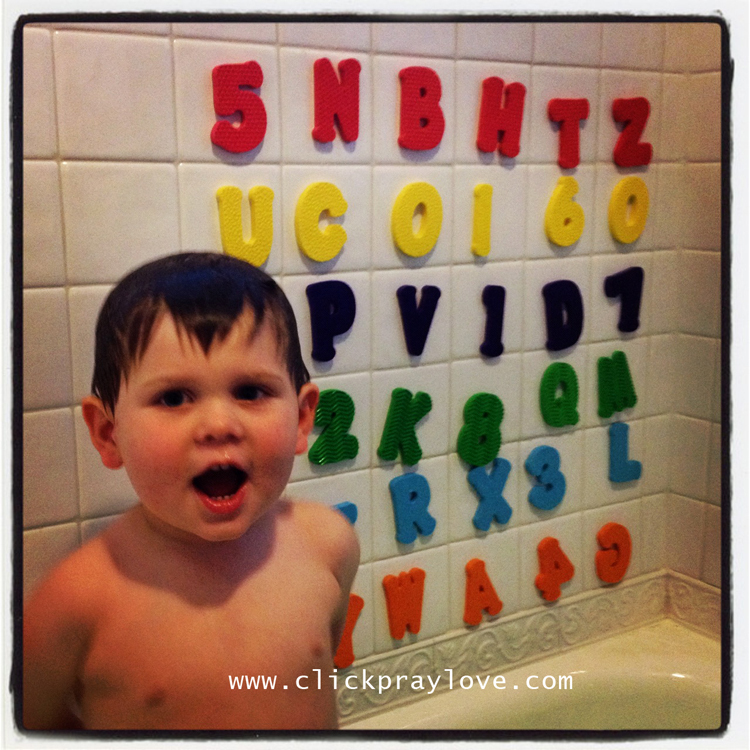 He plays with foam letters during bath time every night asking Sam to spell various words. He picks two different foam letters to take to bed with him each night. He asks me to tell a story about letters and sing the alphabet song during our bedtime routine. While riding in the car he will often point and call out letters he sees on street signs. He asks what letter a word begins with and enjoys trying to sound out the word and guess the letter himself. Sam has printed out an alphabet sheet from the Letter Factory that he enjoys looking at. Recently, Sam printed Letter Factory flash cards, which I laminated (Thanks to Jessica of Running with Scissors for this free printable. Her hand drawn flash cards are AWESOME). 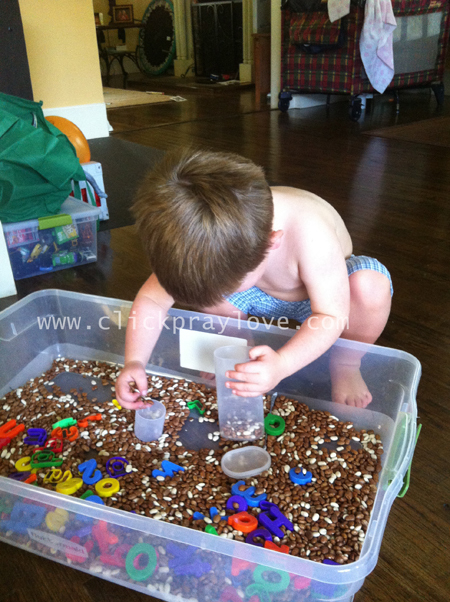 He has enjoyed putting them in order while singing the alphabet song. 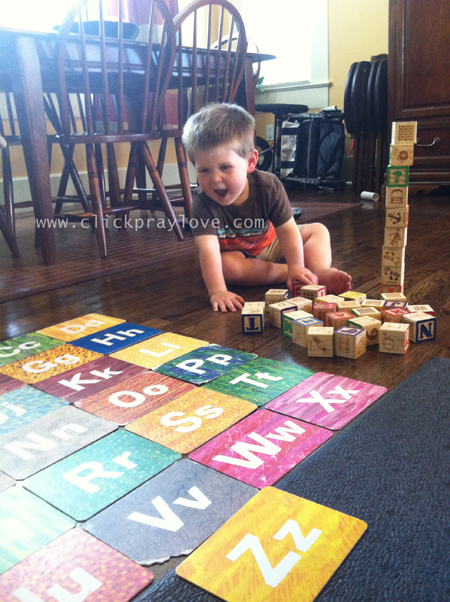 He likes to put his wooden alphabet blocks in alphabetical order or use them to build a pyramid. I could probably go on, but I think if I were to look back on this post years from now I would remember this time with joy and LAUGHter. It is easy for the outsider to view his love of letters as an unhealthy obsession, but I assure you he continues to play with other toys, interact with other children without mention of letters, and apply all that he is learning in an appropriate way. His memory blows me away (as does the memory of all children at this age), as well as his ability to apply the sounds the letters make to various words. He is so much fun!!!! *The links in this post are affiliate links. I do benefit if you buy from those links, but it is of no cost to you. He is so adorable! <3 these pictures! That's so cute how he just latches onto something and loves it that much! We may have to check out Leapfrog Letter Factory, too! Bennett's and Bradford's interactive video engagement, aka dancing/rocking cracks me up...and I love the breakfast conversation.